PHILADELPHIA — A few thousand Naval Academy alumni fell for some cyber subterfuge in the days leading up to this year’s Army-Navy football game, as one West Point faithful took to social media trickery and tongue-in-cheek press releases to poke fun at his goat rivals. Ahead of the game, Mike Nemeth, a 2004 West Point graduate, set up a seemingly friendly Facebook page titled, “Naval Academy Football Alumni,” complete with a banner photo of the Naval Academy band and yellow and blue “Beat Army” strewn across the image. A West Point grad wrote a fake news release that the City of Annapolis proclaimed Friday to be "Go Army Beat Navy" day. According to his most recent metrics, about 5,300 alums saw it. But, more importantly, 1,500 accepted the page’s offer to receive text message updates. That’s where Nemeth’s fun began, poking fun at his maritime counterparts for the past week through a series of pesky texts. “Thanks for your $10 donation to Army Athletics! 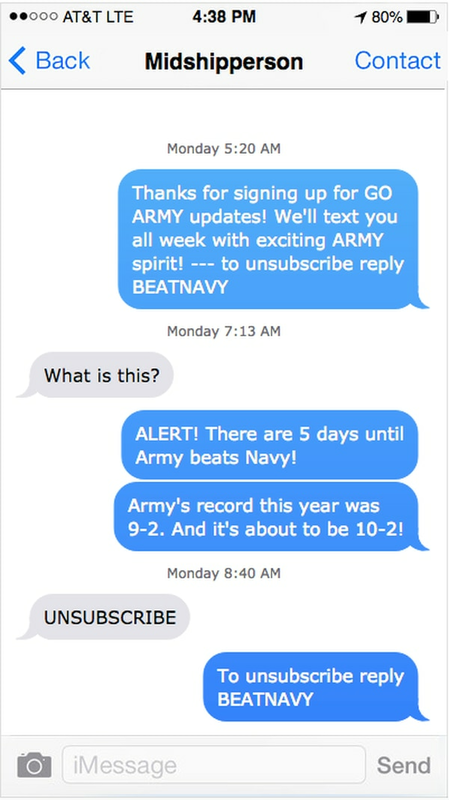 We appreciate your help to Beat Navy!” one text read. “Sorry – wrong number,” was the reply. “Hi Steve! Thanks for your recurring monthly gift of $500 to Army Athletics!” Nemeth wrote another. “How did you get this number? Who is this?” the recipient replied. “We’re sorry. 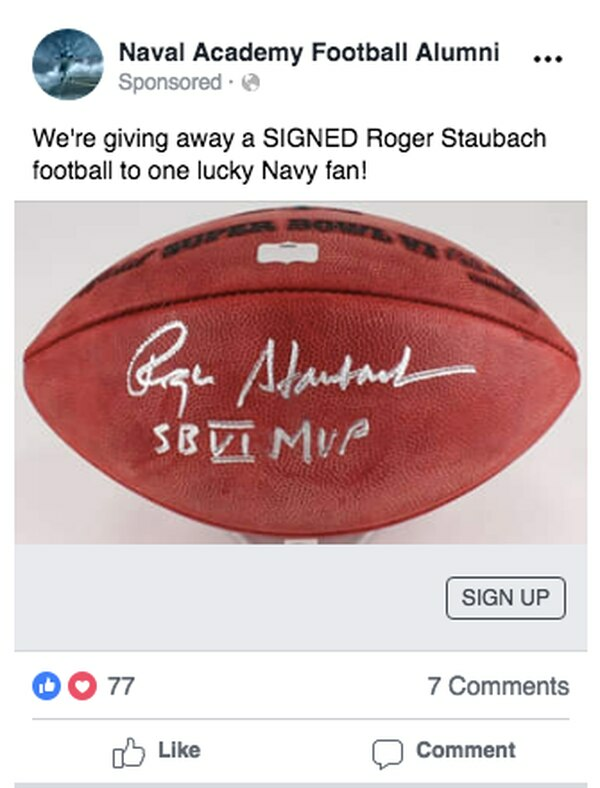 You did not win the autographed Navy football,” Nemeth wrote. “I knew that seemed too good to be true. Well played. Go Navy!” the recipient wrote. This isn’t the first pranking that Nemeth has done on behalf of his alma mater. In 2015, he wrote up a faux news release on the site PR Newswire that was picked up by Yahoo! News and tweeted by West Point-affiliated Twitter accounts. 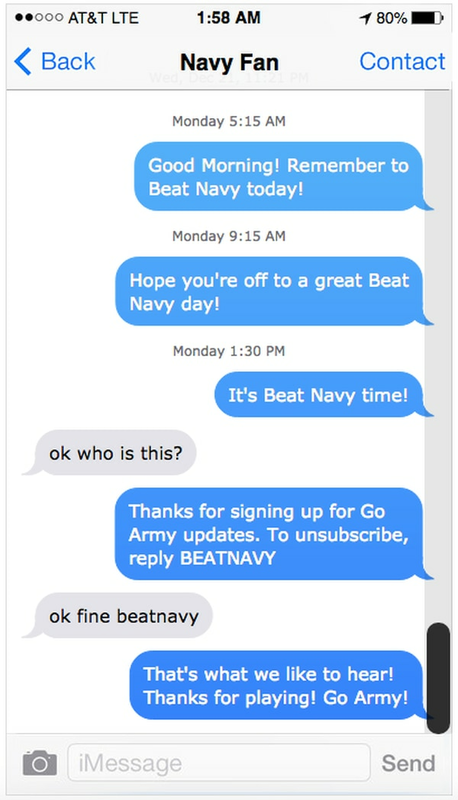 The release used made-up quotes from then-Annapolis Mayor Mike Pantiledes announcing the first “Go Army Beat Navy Week" in the hometown of the Naval Academy. “Sink Boats, Dunk a Mid, Fun for Your Whole Platoon!” the announcement said. The city’s spokeswoman quickly put the fake announcement to rest. “We know these pranks happen every year and we look forward to them, but to that I say, ‘Go Navy!’” said Rhonda Wardlaw. Nemeth also took note of the recent Army-Navy uniform reveals, concocting a press release and micro website to announce a fake partnership between the Fisher Price toy company and the Navy Team for a new uniform honoring toy goats. The site and release contain Navy uniform photos but with cartoon toy goats in place of the school’s goat mascot. This time he used the Naval Academy superintendent as the mouthpiece of a fake quote. Nemeth admits not all of the responses were kind. But no matter. After a short break following the 119th game between the two rivals, the prankster will return to planning next year’s event. 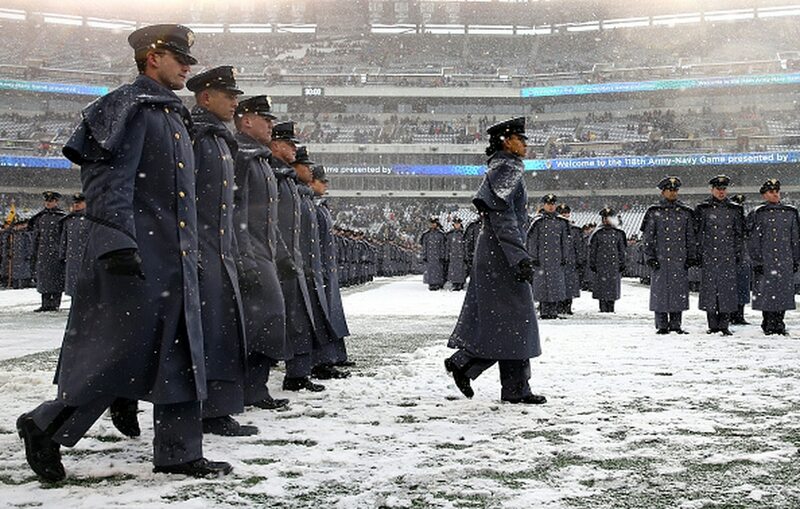 Army took on Navy today at Lincoln Financial Field in Philadelphia, Pennsylvania.